You'll be £25.00 closer to your next £10.00 credit when you purchase St Valery and Its Aftermath. What's this? During the German May 1940 offensive, the 51st (Highland) Division, including the 1st and 5th Battalions Gordon Highlanders, became separated from the British Expeditionary Force. After a heroic stand at St Valery-en-Caux the Division surrendered when fog thwarted efforts to evacuate them. Within days, scores of Gordons had escaped and were on the run through Nazi-occupied France. Many reached Britain after feats of great courage and tenacity, including recapture and imprisonment often in atrocious conditions in France, Spain or North Africa. Those imprisoned in Eastern Europe were forced to work in coal and salt mines, quarries, factories and farms. Some died through unsafe conditions or the brutality of their captors. Others escaped, on occasion fighting with distinction alongside Resistance forces. Many had to endure the brutal 1945 winter march away from the advancing Allies before their eventual liberation. This superbly researched book contains many inspiring stories that deserve and merit reading. At times this book is monumentally sad. At other times it's humorous. The shining light through it all is the tenacity of the soldiers from the North East corner of Scotland, who through no fault of their own, found themselves in captivity for the best part of the war. I learnt a lot from this book and highly recommend it to anyone who has an interest in the Gordon Highlanders or prisoners of war from this historical event. It’s a great read! The British press, especially in 1940, had a wonderful way of expressing bad news in such a way that the public almost believed we did well. Dunkirk and the soldiers rescued from the beaches is a classic example. The news of loss of the British Expeditionary Force was overshadowed by stirring stories of the soldiers rescued from the beaches. 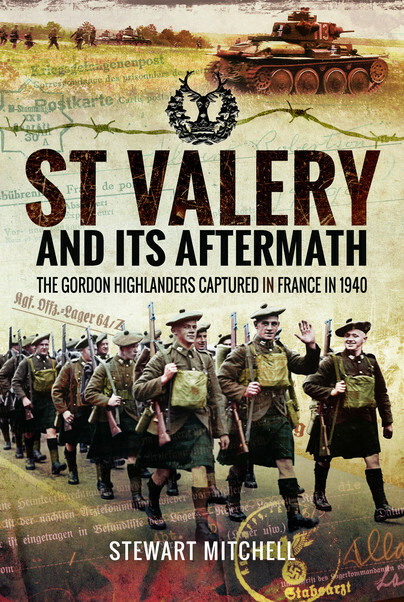 Little was said about thousands more, including the Gordon Highlanders who made a heroic stand at St Valery. Attempts to rescue them was abandoned because of fog. While many units were ordered to surrender, for others, who had become separated from their companies, it became every man for himself. These, and individuals who escaped from their German captors made the way across occupied France, over the mountains to Spain. Eventually to Gibraltar and home. Many were captured! Stewart Mitchell weaves a well researched story of the fate of these escapers and the Highlanders who became prisoners of war. Previous books and films have mainly described Officer Prison Camps where they were exempted work. The Highlanders were work slaves, in labour gangs in salt mines and coal mines or where-ever the were needed. As the end of the war approached and the Russian army swept through Poland, their frightened German guards, fearing being captured by the Russians; herded caravans of shuffling, starving prisoners in below zero weather to overcrowded camps or slept rough in fields. The story is comfortable read, a page turner and fills a gap ones knowledge of the fate of the British Expeditionary Force in 1940. Stewart Mitchell became Volunteer Researcher at the Gordons Museum, Aberdeen in 2005 after a career in environmental protection. He lives with his wife at Bridge of Don, Aberdeen.